We get many emails covering the next generation Apple iPhone, apparently going to be called the iPhone 5. Today we have two things to share with you covering the final iPhone 5 render design based on what we know about the smartphones rumours as well as a little information covering the release date hint via Verizon. 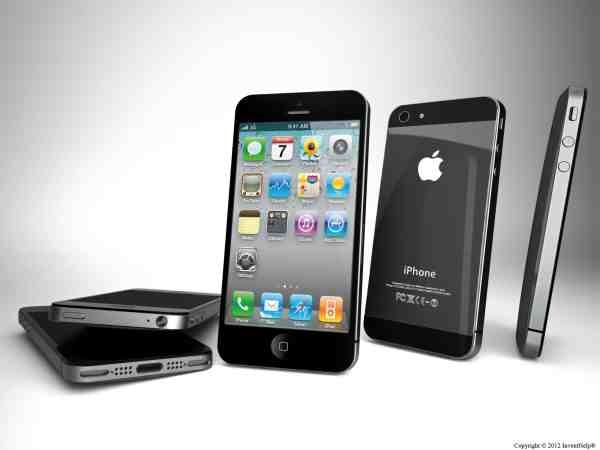 No one on earth knows what the next iPhone will look like, but we received an email with a photo (Shown Below) of what the iPhone 5 will look like giving a good approximation of its design and appearance based on a few rumours, such as a redesigned faceplate, 4-inch display screen, 19-Pin mini pin dock connector, and dimensions of 120mm x 58.6mm x 7.9mm. We would like to thank InventHelp for their photo rendering, so here it is — thanks. Now let’s move onto the Verizon release hint via Cnet, Verizon CFO Fran Shammo believes that the next-gen iPhone by Apple expects it to get a fourth-quarter launch, this was mentioned in the company’s quarterly conference call yesterday. The new handset is believed to have a new design, may possibly tap into the faster 4G LTE network and a bigger display. If the Q4 launch does come true then that means we could all see an October release just like the iPhone 4S in 2011. Apple is as usual keeping its lips shut, as soon as we know more we will notify you. We had a massive response when we reported the news covering the “iPhone 5 threatens to embarrass the Samsung Galaxy S3”, please read more about this here and let us know what your views are. You may be interested about the production and price point strategy, we always report what we get sent to us via email and of course news related sources. We all have to use our imagination until Apple decides to reveal all at its next WWDC 2012 event. What do you think the name of the new Apple smartphone will be? For everything on the iPhone 5 please visit our dedicated section. it looks hefty, i am sure it will be the final design lets see! It has taken Apple 3 years to come up with this ? Im not being funny but im not going to purchase something that looks like the cool phone of 2009! This is 2012 and im not going to upgrade my handset to that pile of junk, if anything I will just get a new back cover for my iPhone 4 (off ebay) to make it look like the iphoneÂ 5 – Sorted.Â Maybe at the same time ill go buy a tube tv, as I love going backwards with technology and design APPLE! I think you will find it looks andÂ dated. how low can apple go !! First off if u were a “diehard iPhone fan” then you’d never defect to any android handset secondly what can any company really do that is revolutionary design wise.They seem to have addressed all the major android fan boy complaints a more durable metal back and a larger screen. You don’t have to reinvent the wheel to make a better wheel. And apple knows this better than anyone. They are masters of industrial design and take form and function very seriously. Would you be happy if it had sparklers and streamers flying off it that would look new it would also look like crap. I too was disappointed when they didn’t give us a new design lastvyear mainly because of all the hype leading up to the launch but instill bout a 4s and it’s is was faster than my old 4 espicalky while jailbroken it runs very smoothly. And I’m sure that ” the new iPhone ” will go even further in blowing me away with it performance and speed. I have to say, but I dont want to be rude. Im guessing your not a designer, and buy that I mean when you say “What can any company really do thatÂ is revolutionary design wise” – This must mean I will expect to see the iPhone 15 looking pretty much the same as this then ? There is plenty that can be done to change the overall look. just google future phone designs for instanseÂ or pop down your local college and have a chat with somebody on a design course, im sure you will be suprised. metals, or something different, then I think they really could win this race. its ta-ra Apple! Hello Samsung…. I’m an android user….waiting to swap for an Iphone 5.Â If Appleholics out there allready have Iphones then yes maybe the design is a bit dissapointing, however its apple, were talking about here, wouldnt be suprised thats is somethings completely different to what were reading on here and websites.Â Apple are famous for making us predict something because they always take so long however be patient and apple willÂ give you with an amazing design IOs 6 and an amazing phone. Would you buy a Ferrari if it had a skoda body shell? NO so the iPhone 5 can be as fast as it likes and do as much as it likes but it still looks the same, like someone said google iPhone designs and have a look some of these are awesome, come on Apple get with the program, I sold my 4 and got a htc one x, awesome looking phone just a shame it wasn’t as good under the hood as it was on top, it has been returned and I was going to wait for the 5 but OMG not if it looks like this. Maybe time they removed the physical home button with a touch sens one?? After all this double tapping the home button with my current iphone 4 which, I’ve had since release, is causing the button to become less responsive! As a huge fan of Apple products, I would be severely disappointed if this was the iPhone 5. Why would I want to upgrade to a phone barely different in looks to the one I own now? It’s time for something fresh from Apple! Â I bet Steve would like to wake up,but he’s dead! I want the iphone right now! how much is the iphone 5 would be? Propably $800-$900 US dollars for 64GB. That’s excluding taxes. Better than Samsung that won’t be possible. Being the owner the Galaxy S3 i already know apple is looking up to Samsung. And from an software standpoint apple is a joke and so is it’s platform in general.